If you have been reading this blog for any length of time, you will know that Nicholson Baker is one of my favorite contemporary authors. 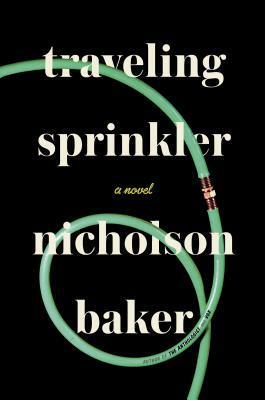 Traveling Sprinkler is a sequel to one of my favorite Baker books, The Anthologist. It continues the story of his main character, Paul Chowder, a poet and, in the case of this novel, aspiring song-writer. The Anthologist was about Chowder’s attempts to write an introduction to his forthcoming poetry anthology, and in this new book, the anthology has come out, and Chowder is supposed to be writing new poetry. Instead, he spends his time learning music software and trying to win back his ex-girlfriend Roz. The format is typical Baker: his main character thinks about the world around him, shares his thoughts on this and that, and not much happens. National Walking Sprinkler of Nebraska made Wilson’s machines, and they still do. They made them for Sears and that’s where my father bought his. Everything about it is immediately understandable. It’s what America did before it threw itself wholeheartedly into the making of weapons that kill everyone. I have been trying to write a poem about this sprinkler for years, because I like it so much, and I’ve never managed to do it. What a joy now to wind it around Nan’s tomatoes and watch it, in all its intuitive clumsy ungainly beauty, do some good. Chowder is trying to appreciate what good there is in the world, as a counterweight to all that is bad. This effort may not get him very far, but it’s a worthy way to spend his time, at least. So even with my doubts along the way, I was feeling warmly toward the book by the end. It has large things to say about the world, but it does it in an understated, charming manner that I find hard to resist. I love books where the narrative voice grabs you and simply won’t let you put the thing down. These are the books where I find myself reading passages out loud just because I have to hear how the voice actually sounds and very often for the joy of the rhythm involved. I haven’t read Baker but clearly I should give him a go. Where should I start? Yes, Baker definitely makes me slow down in my reading to appreciate the sentences and see how he creates the voice. I would start with either The Mezzanine or The Anthologist. The Mezzanine is probably his best book, but The Anthologist is very enjoyable as well. I haven’t managed to read The Anthologist yet even though it has been sitting on the shelf above my desk for, well a long time. Next month is the Twin Cities Book Festival and was very excited to find out Baker is going to be there. I am going to do my best to get into his session! Lucky you! I haven’t managed to see Baker yet, but hopefully I will. It helps that he lives on the east coast. Maybe he will come to NYC one day. I had missed this one — I really enjoyed The Anthologist so this makes me happy! Also, “Chowder is trying to appreciate what good there is in the world, as a counterweight to all that is bad” strikes me as a useful attitude to cultivate, when so much bad is continually broadcast to us all.